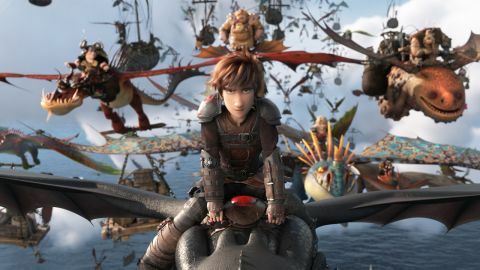 How to Train your Dragon: The Hidden World review: "Exciting, moving, and fabulous to look at"
One of the decade’s most accomplished fantasy sagas signs off with a finale that’s exciting, moving and fabulous to look at. Having been deprived of a limb in the first How to Train Your Dragon and a loving father in the second, youthful Viking Hiccup (Jay Baruchel) has suffered enough, you might think. Yet the third entry in DreamWorks’ heart-stirring fantasy series has one more trauma to inflict on its callow protagonist: the prospect of a fond farewell to his scaly companion Toothless, a dragon whose slim hopes of survival depend on getting as far away from humankind as possible. Yes, like the Toy Story films and Ralph Breaks The Internet, How to Train Your Dragon: The Hidden World is all about separation anxiety, something fans will be feeling too at the thought of seeing one of animation’s most winning double acts call it a day. Yet it’s not only sinister dragon hunter Grimmel (F. Murray Abraham) who’s out to part Hiccup from his trusty Night Fury. There’s also a beguiling dragoness – christened the Light Fury by Hiccup’s sorta-girlfriend Astrid – whose charms have Toothless contemplating a life beyond the Nordic village that has become his home. The problem is that Berk is home to many more beasties than that, mostly thanks to Hiccup’s insistence on stealth missions that result in caged firebreathers being liberated from their piratical captors. The human-to-wyvern ratio has now become unsustainable, prompting the newly installed chief to seek out a mythical utopia – the Hidden World of the title – where Toothless and his flying friends can finally be safe. The daring expedition across the sea that ensues literally broadens the horizons of a threequel that admirably aims to up the ante visually – not least when it arrives at the Hidden World itself, a hole in the ocean (just go with it) that leads to a jaw-dropping network of caverns bathed in psychedelic bioluminescence. Yet as spectacular as this is, it’s when the film is at its simplest that it proves most irresistible, as shown by a glorious courtship sequence between Toothless and Light Fury that gives a virtual, virtually silent masterclass in creature-based cartooning. Admittedly, not everything is fang-tastic in Dean DeBlois’ triptych closer. Hiccup’s dragon-riding mum Valka (Cate Blanchett), such a pivotal presence in How to Train Your Dragon 2, cuts a worryingly peripheral figure this time around, while there are a few too many ‘comic’ shenanigans from the assorted Berkian sidekicks. Abraham, meanwhile, is disappointingly pedestrian as Grimmel, a (Ama)deus ex machina whose hatred of Toothless is never satisfyingly explained. When all is said and done, however, it’s the dragons that make this series soar. Small wonder, then, that DeBlois packs the frame with them, in such a dazzling array of varieties (check out the scorpion-like behemoths Grimmel has as his personal heavies, or the endlessly multiplying Hobgobblers) that you can only look on agog. Throw in a real tear-jerker of a climax, made all the more so by John Powell’s elegiac score, and you are left with a rare beast indeed in this world of never-ending franchises: a saga that knows when it’s time to quit. For more hotly anticipated films, check out our list of the upcoming movies you don't want to miss, or catch up on best movies of 2018 you may have missed.